Still looking for that perfect pair of sunglasses? Well, you may be in luck! College Gloss is teaming up with Rich and Famous Eyewear to give one lucky reader a pair of brand-new, awesome shades from their Limited Edition Purple Reign Collection! Rich and Famous Eyewear is a trendy sunglass company that aims to provide “a portal into the lifestyles of the rich and famous.” They are dedicated to providing fashionable, quality eyewear at an affordable price. Their Limited Edition Purple Reign Collection features a variety of polarized shades ranging from vintage glamour to modern hip. Want to win a pair of these amazing, new shades? All you need to do is “like” CG’s Facebook page and comment below with your name and email address. 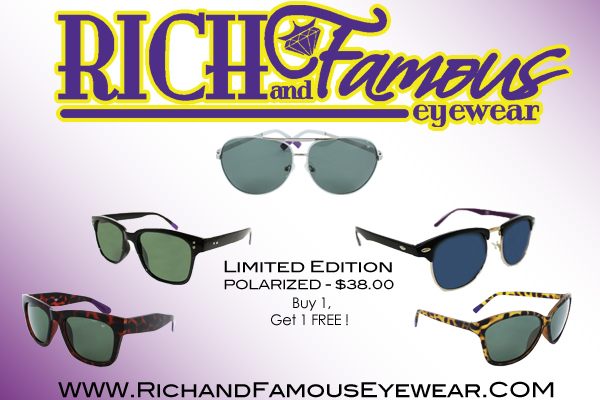 Additionally, in honor of the release of their Limited Edition Purple Reign eyeglasses, Rich and Famous Eyewear is sponsoring a “Live Rich and Famous” contest, which will award one grand prize winner with a trip for two to Beverly Hills, two nights in the Beverly Hills Hotel, tickets to see a taping of 2 Broke Girls, a style session with celebrity stylist Miles Siggins (Ryan Seacrest’s stylist!) and two Limited Edition Purple Reign sunglasses. Visit EyeAspire.com to find out how to enter. College Gloss and Rich and Famous Eyewear fans who participate in our Back to School Live Twitter Chat Monday, August 13th from 8-9 p.m. EST also will receive a special discount and might just win a prize! Use the code: BACK2SCHOOL to receive 20% off your purchase! Please email liz@collegegloss.com to claim your prize! Looking for the perfect pair of shades to end the summer looking good and get my last semester of college off to a good start! Jane Marie Agnew you can get lots off product online try to use different website. I am also buy eyewear from online.